A quick reminder about two NAT types used in Neutron. SNAT refers to source NAT, or, changing the source address of packets as they leave the external device of a router. This is used for traffic originating from VMs that have no floating IP attached. A router is allocated a single IP address from the external network which is shared across all VMs connected to all subnets the router is connected to. 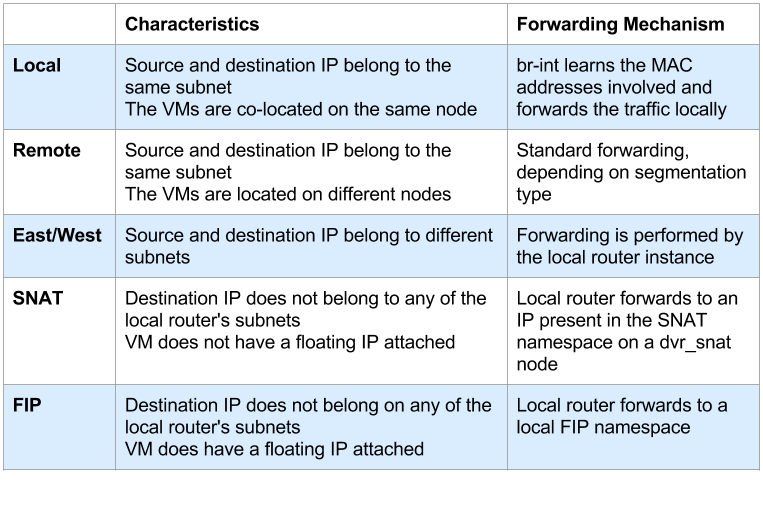 Sessions are differentiated according to the full tuple of (source IP, destination IP, source port, destination port). This is typically known as ‘PAT’, or port address translation in the networking world. Floating IPs, sometimes called DNAT (Destination NAT) in Neutronland, implement a much simpler form of NAT, a 1:1 private to public address translation. You can assign a VM a floating IP and access it from the outside world. DVR distributes floating IPs north/south traffic to the compute node, just as it does for east/west traffic. This will be explained in the next blog post. SNAT north/south traffic, however, is not distributed to the compute nodes, but remains centralized on your typical network nodes. Why is this? Intuitively, you’re going to need an address from the external network on every node providing the SNAT service. This quickly becomes a matter of balance – How far would you like to distribute SNAT vs consumption of addresses on your external network(s)? The approach that was chosen is to not distribute the SNAT service at all, but keep it centralized like legacy routers. The next step would be to make the SNAT portion of distributed routers highly available by integrating DVR with L3 HA, and this work is planned for the Liberty cycle. Note that the router has two ports in each internal network. This is an implementation detail that you can safely ignore for now and will be explained later. We can see two new ‘sg’ devices in the SNAT namespace, and the familiar ‘qg’ / external device (Which is not present in the qrouter namespces). Where did these ‘sg’ devices come from? These are additional ports, one for each internal network the router is connected to. This is why the router now has two ports in every internal network, the ‘qr’ device on compute nodes, and the ‘sg’ device in the SNAT namespace. These ‘sg’ ports are used as an extra hop during VM SNAT traffic. When a VM without a floating IP sends traffic destined to the outside world, it hits the qrouter namespace on its node, which redirects the message to the SNAT namespace. To achieve this, some source routing trickery is used. Here’s a concise source routing tutorial. Now that you are familiar with ‘ip rule’, the idea of multiple routing tables and source routing, let’s move on! We can observe that 10.0.0.3 and 20.0.0.3 are the ‘sg’ devices for the same router in the SNAT namespace on the dvr_snat node. How then is east/west traffic and SNAT traffic classified and routed? If a VM in the 10.0.0.0/24 subnet on the local compute node pings a remote VM in the 20.0.0.0/24, we’d expect that to get classified as east/west traffic and go through the process explained in the previous blog post. The source guest OS puts 20.0.0.x in the destination IP and the MAC address of its default gateway in the packet and frame respectively. br-int forwards the message to the qrouter namespace on the local node, and the namespace’s ip rules are consulted. ip rules are processed according to their priority (Lowest to highest), which is listed in the first column in the ‘ip rule’ output above. The main routing table has an entry for 20.0.0.0/24 thus the message is forwarded out the appropriate ‘qr’ device. If the same VM ping’d 8.8.8.8, however, it’d be a different story. The main routing table would be consulted first, however, it cannot match 8.8.8.8, and the main routing table doesn’t have a default route. 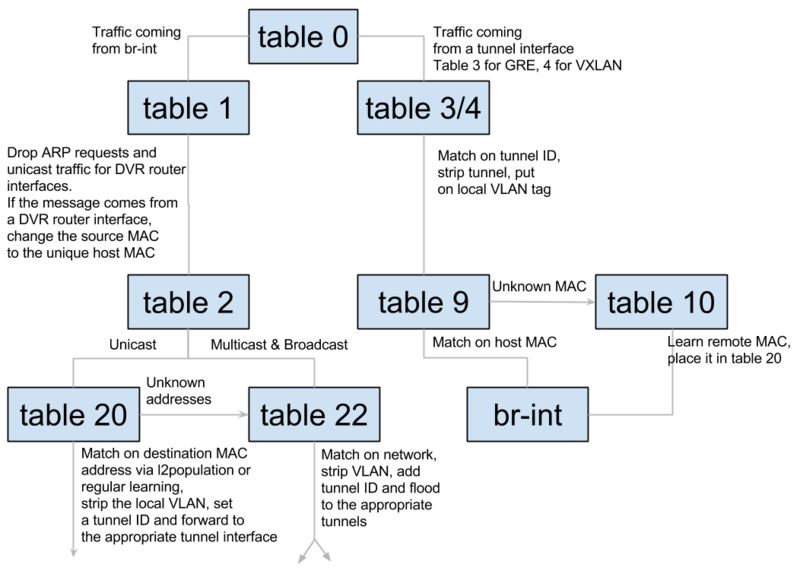 Let’s take another look at the routing rules in place: The main routing table was consulted but did not hit a match. The ‘default’ table is empty. Can we match any of the remaining rules? Of course, the source IP address is in the 10.0.0.0/24 range, thus the fourth rule matches and the 167772161 table is consulted. We can see that it contains a single entry, a default route. The message is then routed to 10.0.0.3 (The ‘sg’ device for the subnet) via that subnet’s local ‘qr’ device. Interestingly, this is the same device the message came in on. At this point, standard DVR east/west routing takes place and the message eventually finds itself in the SNAT namespace on the dvr_snat node, where it is routed out via the ‘qg’ / external device, right after SNAT iptables rules change the source IP from the VM to the ‘qg’ device IP. DVR aims to isolate the failure domain of the traditional network node and to optimize network traffic by eliminating the centralized L3 agent shown above. It does that by moving most of the routing previously performed on the network node to the compute nodes. East/west traffic (Traffic between different networks in the same tenant, for example between different tiers of your app) previously all went through one of your network nodes whereas with DVR it will bypass the network node, going directly between the compute nodes hosting the VMs. North/south traffic with floating IPs (Traffic originating from the external network to VMs using floating IPs, or the other way around) will not go through the network node, but will be routed directly by the compute node hosting the VM. As you can understand, DVR asserts that your compute nodes are directly connected to your external network(s). North/south traffic for VMs without floating IPs will still be routed through the network node (Distributing SNAT poses another set of challenges). Each of these traffic categories introduces its own set of complexities and will be explained in separate blog posts. The following sections depicts the requirements and the previous blog post lists the required configuration changes. 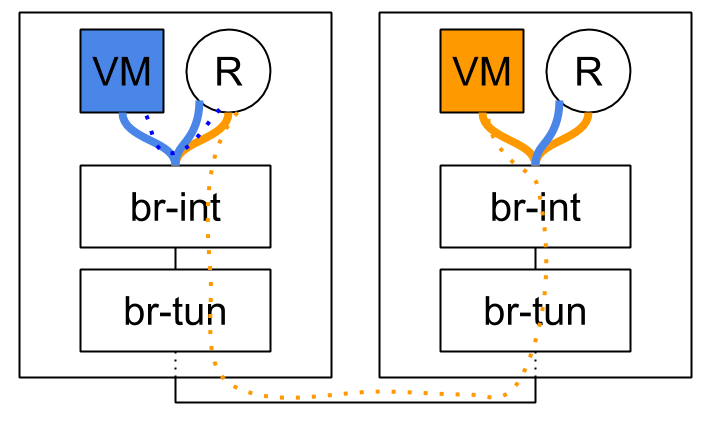 In this example, the blue VM pings the orange VM. As you can see via the dotted line, routing occurs in the source host. The router present on both compute nodes is the same router. For the purpose of east/west traffic we will happily ignore the SNAT / centralized portion of distributed routers. Since DVR routers are spawned on compute nodes, and a deployment can potentially have a great deal of them, it becomes important to optimize and create instances of DVR routers only when and where it makes sense. Before tracking a packet from one VM to the next, let’s outline an issue with the nature of distributed ports. As we can see in the ‘ip address’ output above, DVR router replicas are scheduled to all relevant compute nodes. This means that the exact same interface (MAC and IP address included!) is present in more than one place in the network. Without taking special precautions this could result in a catastrophe. When using VLAN tenant networks, the underlay hardware switches will re-learn the router’s internal devices MAC addresses again and again from different ports. This could cause issues, depending on the switch and how it is configured (Some admins enable security measures to disable re-learning a MAC on a different port by shutting down the offending port). Generally speaking, it is a fundamental networking assumption that a MAC address should only be present in one location in the network at a time. Regardless of the segmentation type, the virtual switches on a given compute node would learn that the MAC address is present both locally and remotely, resulting in a similar effect as with the hardware underlay switches. The chosen solution was to allocate a unique MAC address per compute node. When a DVR-enabled OVS agent starts, it requests its MAC address from the server via a new RPC message. If one exists, it is returned, otherwise a new address is generated, persisted in the database in a new Host MACs table and returned. This address is then used whenever traffic from a DVR router leaves the machine; The source MAC address of the DVR interface is replaced with the host’s MAC address via OVS flows. As for the reverse, it is assumed that you may not connect more than a single router to a subnet (Which is actually an incorrect assumption as the API allows this). When traffic comes in to a compute node, and it matches a local VM’s MAC address and his network’s segmentation ID, then the source MAC is replaced from the remote machine’s host MAC to that VM’s gateway MAC. 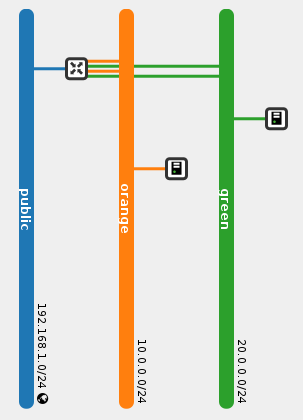 Let’s track unicast traffic from the local VM ‘blue’ on the blue subnet to a remote VM orange on the orange subnet. It will first be forwarded from the blue VM to its local gateway through br-int and arrive at the router namespace. The router will route to the remote VM’s orange subnet, effectively replacing the source MAC to its orange interface, and the destination MAC with the orange VM’s MAC (How does it know this MAC? More on this in the next section). It then sends the packet back to br-int, which forwards it again to br-tun. Upon arrival to br-tun’s table 0, the traffic is classified as traffic coming from br-int and is redirected to table 1. The source MAC at this point is the router’s orange MAC and is thus changed to the local host’s MAC and redirected to table 2. The traffic is classified as unicast traffic and is redirected to table 20, where l2pop inserted a flow for the remote VM’s orange MAC and the traffic is sent out through the appropriate tunnel with the relevant tunnel ID. When the traffic arrives at the remote host, it is forwarded to br-tun which redirects the traffic to table 4 (Assuming VXLAN). The tunnel ID is matched and a local VLAN tag is strapped on (This is so the network could be matched when it arrives on br-int). In table 9, the host MAC of the first host is matched, and the traffic is forwarded to br-int. 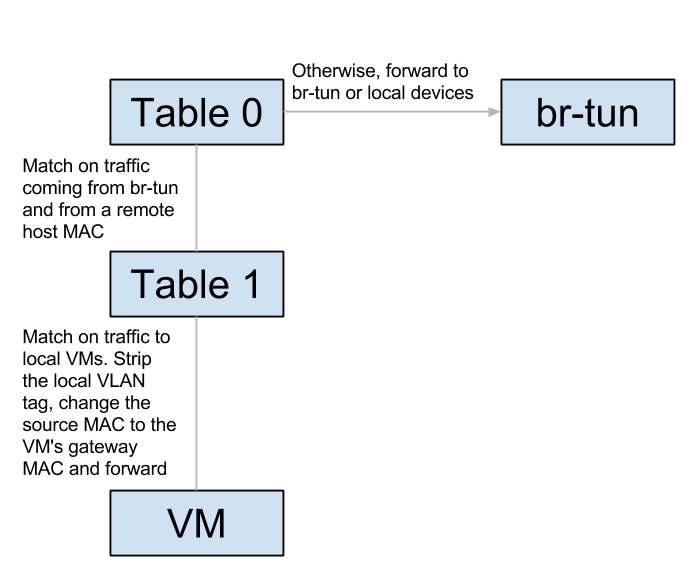 In br-int, the traffic is redirected to table 1 because it matches the source MAC of the first host. Finally, the local VLAN tag is stripped, the source MAC is changed again to match the router’s orange MAC and the traffic is forwarded to the orange VM. Success! Permanent / static records, that’s curious… How’d they end up there? As it turns out, part of the process of configuring a DVR router is populating static ARP entries for every port on an interface’s subnet. 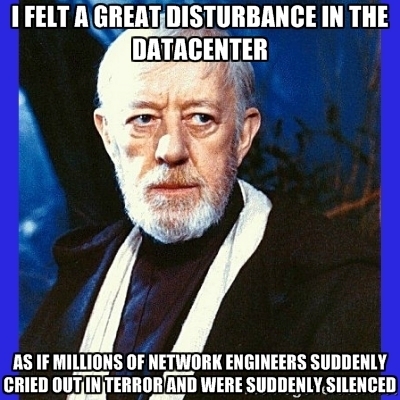 This is done whenever a new router is scheduled to a L3 agent, or an interface is added to an existing router. Every relevant L3 agent receives the notification, and when adding the interface to the router (Or configuring a new router), it asks for all of the ports on the interface’s subnet via a new RPC method. It then adds a static ARP entry for every port. Whenever a new port is created, or an existing unbound port’s MAC address is changed, all L3 agents hosting a DVR router attached to the port’s subnet are notified via another new RPC method, and an ARP entry is added (Or deleted) from the relevant router. I recently configured a multi-node Devstack DVR setup and thought it might be useful to share my experience. I use three VMs: 192.168.0.1/2/3. Each VM has one NIC with internet access. I normally run Devstack Neutron VMs with only one NIC – If the instances you create inside this environment require internet access, just connect the NIC to br-ex and move the IP addressing information to be-ex. I designate one VM as an ‘all-in-one’ (API servers, compute, and network), the second VM as a compute, and the third as a network node. This allows me to test DVR east-west routing (This is why I have two computes) as well as default SNAT behavior (Requires a dedicated network node / A l3 agent in ‘dvr-snat’ mode). I dislike Devstack flags/macros and prefer to configure the services myself with [post-config] sections. This soothes my control-freak nature and allows me to assert that I understand how the configuration should end up looking like.